Back in the late-1970s, a Democrat, Jeanne Kirkpatrick wrote an essay in Commentary Magazine critiquing President Carter's foreign policy. She drew a distinction between authoritarian and totalitarian regimes. The former, like Chile, had a market economy but not democracy. The latter, like the Soviet Union and Cuba, had neither markets nor democracy. She argued that authoritarian regimes could be reformed, but not totalitarian regimes. Her argument won her notice of the Republican presidential contender, Ronald Reagan. After his electoral victory, Jeanne Kirkpatrick become the ambassador to the United Nations. Leaving aside the merits of her argument in light of the subsequent historical experience, it raised an important point that the weekend events in Hong Kong underscore. Hong Kong citizens have liberty, though as this Great Graphic in today's South China Morning Post illustrates, it can be dramatically circumscribed. 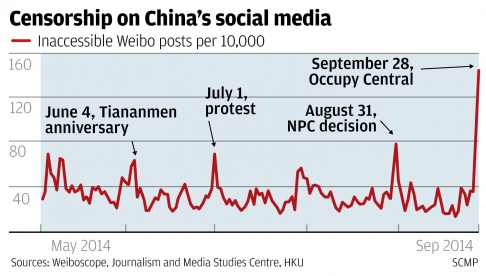 Censorship of the internet rose to record levels--a five-fold increase over the past weekend, according to Weiboscope, a censorship monitoring project at the University Hong Kong. In the seven days up through September 26, it found that 32 messages had been deleted from every 10,000 posts. On Saturday the number surged to 98 posts and 152 on Sunday. Hong Kong is part of China, which is why statistics that count China's shipment of goods to Hong Kong as exports is nonsensical. It makes even less sense to argue that denominating such trade in yuan is tantamount to the internationalization of the Chinese currency. As a Special Administrative Region, China allows Hong Kong residents greater liberty than mainland Chinese enjoy. The demonstrations are about freedom. Simply put, they want more than China is willing to allow. Hong Kong wants to pick their leader (in 2017). China is willing to allow it to chose among candidates that it approves of, and no more. 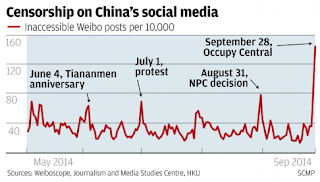 Hong Kong elites and their police do not want to rock the boat. If they show they are incapable or unwilling of settling the domestic strife, Chinese officials can. There is much they can do short of sending in its own forces, which cannot be ultimately ruled out. It can also could curb Hong Kong's other liberties, or even suspend the 2017 popular election. There is another current of thought that notes that when the Communists took over in 1949, Shanghai, a international/western city, was punished. The argument goes that when Shanghai can replace Hong Kong as an onshore financial center, Beijing will look to displace Hong Kong. The problem is that Beijing also wants to win the heart and minds of Taiwan. The worse that Hong Kong is treated, the more Taiwan may seek to preserve its status.